It starts with PERIUMBILICAL pain. This pain is midline, because the primitive gut was a midline structure when it received its innervation, and this is where the pain is perceived when it originates within the appendix without any other tissue being involved. After 12 to 24 hours the infection spreads from the appendix to affect the peritoneum, which is innervated somatically. The pain then manifests in the RIGHT ILIAC FOSSA where the appendix is located. McBurney’s Point is the place where this tenderness is most acute. Attempting to palpate the right iliac fossa typically causes a reflex protective contraction of the muscles of the abdominal wall. This is called GUARDING. Pressing on the area will produce tenderness. A sign that is often associated with appendicitis is REBOUND TENDERNESS. To elicit this, press the abdomen briefly in region of McBurney’s Point. When rebound tenderness is present, the pain gets worse immediately after lifting the palpating hand off the abdomen. 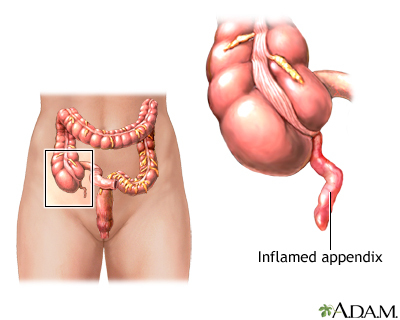 If the appendix ruptures and infective material escapes into the peritoneal cavity causing PERITONITIS, the muscles of the abdominal wall go into a reflex spasm. The abdominal wall feels hard. This is termed RIGIDITY. 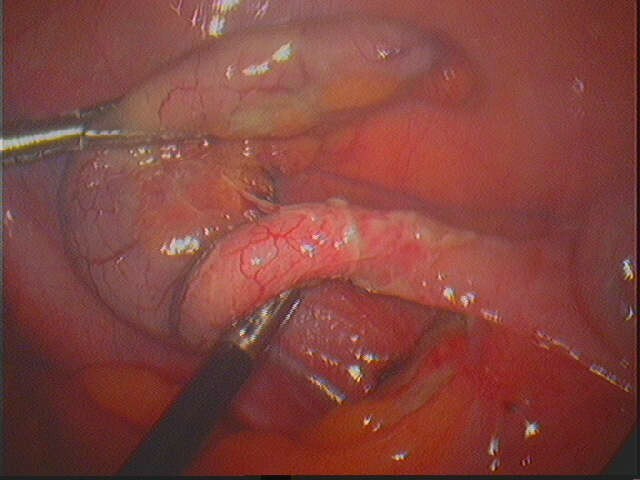 ***** The position of the tip of the appendix is variable, and as a result of this appendicitis can be accompanied by a variety of features depending on what structure the tip is lying near… e.g. the urinary bladder, the Fallopian tube or the intestines. Headnote - Focusing the examination initially on the upper abdomen allows the clinician to gain an early index of suspicion. When examining a patient with suspected appendicitis, instead of immediately mashing on the right lower quadrant (which is guaranteed to cause the patient to tense up and obscure any further attempts to elucidate subtleties of the abdominal examination), focus instead on the upper abdomen. Very gently palpate the left, then the right upper rectus abdominus. When the right lower quadrant inflammatory process has evolved to include the peritoneum, it is remarkable how frequently the right rectus is spastic. When appendicitis is suspected, gently palpate the left, then the right upper rectus abdominus. This contralateral comparison will help determine if the right rectus is spastic, a common sign of acute appendicitis. Having a "built in" contralateral control makes this tension easy to distinguish from the normal left rectus. Focusing the examination initially on the upper abdomen (and away from the area of the patient's greatest discomfort) allows the clinician to gain an early index of suspicion for the diagnosis of appendicitis. The ubiquitous use of computed tomography (seemingly if the patient hiccoughs!) is blunting our collective clinical acumen. I offer a plea to my fellow young surgeons, surgical residents, and students: Don't let technology blind us! Embrace the art of the clinical abdominal examination. This clinical pearl was demonstrated to me by my incredible mentor and dear friend, Thomas J. Howard, MD, who is one of the most prescient clinicians I've ever encountered. As I pass this technique along to our house staff and medical students, I like to call it the "Howard sign". To my knowledge it has never been formally studied or reported; anecdotally, however, this tactic has proved to be quite accurate in supporting the diagnosis of acute appendicitis. When the RLQ inflammatory process has evolved to include the peritoneum, it is remarkable how frequently the right rectus is spastic. SOURCE: Nicholas J Zyromski (2007). Another way to evaluate acute appendicitis. Contemporary Surgery, 63(11), 573.